I was waiting for a long-overdue haircut this morning at Angles in Strathcona. With calming peppermint tea in hand, I looked over my shoulder, past the bank of sinks, to see this row of heads displayed on a shelf along the wall. The backstory was equally interesting. 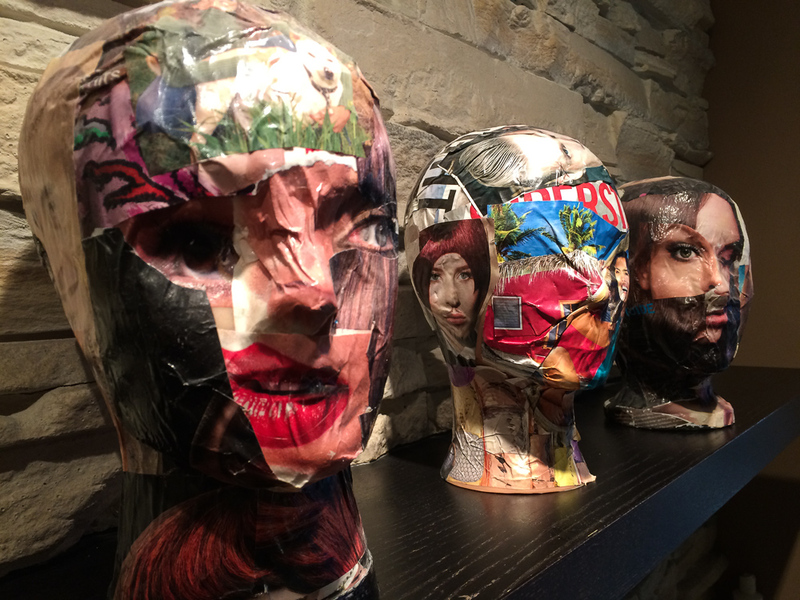 Promoted as a form of therapy for the nonagenarian mother of the founder of this Calgary hair style chain, she took to creating new visages for these hairdressing model heads, using a mosaic of mugshots cut out from fashion magazines. The sculptural effect was, on the one side, rather cubist, like Picasso’s Portrait of Dora Maar (1937). Maar, a nine-year long lover and frequent model of the great Spanish painter, was herself a surrealist photographer. Looking again, they reminded me of the stark, yet alluring muscular exposures captured in the anatomical drawings of Leonardo da Vinci. Thanks to Angles @AnglesStrath, Chris for the haircut and to Cindy for the conversation and story behind these sculptures.